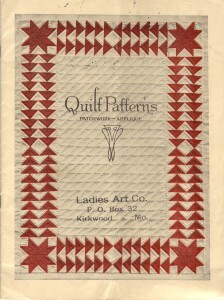 While attending a Kansas City quilt show in the early 1990s, I found reprints of the Ladies Art Company (or LAC) catalogs and patterns at one of the vendor booths. “This is interesting,” I thought to myself. Somehow I hadn’t realized that St. Louis, Missouri, was a focal point for quilt pattern businesses in the first half of the 20th century. Since I live in the St. Louis area I thought it would be interesting to try and collect some original LAC items. That single thought changed the whole direction of my life. I began my research of Ladies Art Company of St. Louis, Missouri. References to their patterns started to pop out at me from quilt magazines and books. Historical articles began to have new meaning for me. I made copies of anything I could find that mentioned LAC and they were filed away for the future. After almost ten years of research, and notebooks, folders and boxes full of information on Ladies Art Company, I am glad the opportunity has come for me to share my knowledge with everyone. The patterns and designs are timeless and multifunctional. I hope you enjoy discovering Ladies Art Company as much as I have. “The Ladies Art Company was established in 1889. It grew to be the most influential published source for the nomenclature of American patchwork quilt patterns. 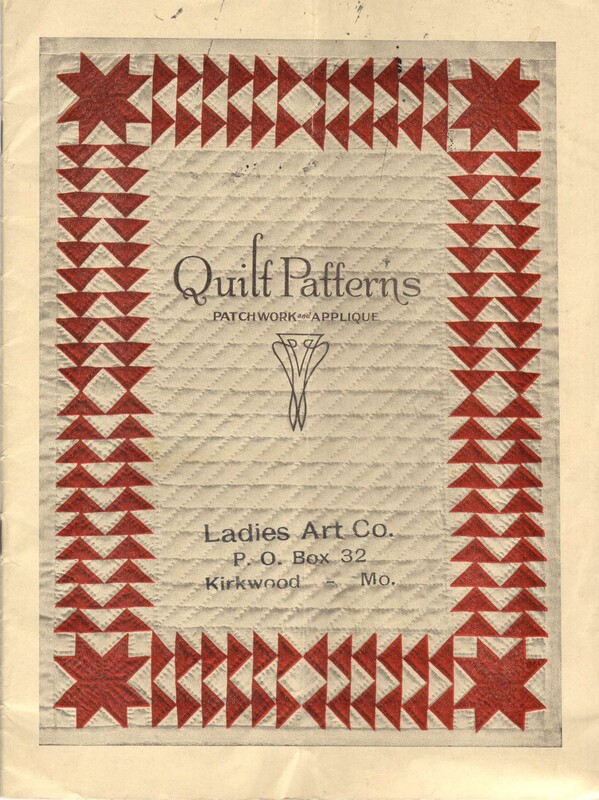 It was the first company to publish a catalog containing hundreds of quilt pattern blocks, with a different name or title attributed to each design. Most of the quilt blocks were formed in a geometric configuration, with a lesser number being of the applique variety. From the late nineteenth century throughout the twentieth century, inventories of quilt pattern published sources and listings, including the 1915 Marie Webster book “Quilts, Their Story and How To Make Them,” The Kansas City Star newspaper quilt patterns, the “Nancy Page” (Florence La Ganke) syndicated quilt columns, the “Nancy Cabot”/ Chicago Tribune/New York Daily News quilt columns and booklets, the Home Art Studio, Des Moines, and others all reflected a liberal utilization of Ladies Art Company’s assigned names for quilt designs. This midwest business became the most employed reference for quilt pattern names in America. Connie Chunn’s approach to researching the Ladies Art Company has been both expansive and unique. Investigating late nineteenth and early twentieth century farm, home and ladies magazines for Ladies Art Company’s published advertisements gave Connie examples of the breadth and scope of the company’s quilt pattern distribution and circulation through the U.S.A. and abroad. Collecting ephemeral sources, such as advertising circulars and brochures supplied her with additional information about the company.